Why Are These Otters Trying To Catch This Flying Butterfly? In the one-minute-and-a-half video which you can watch below, a group of otters can be seen trying everything they can to try and catch a small, white butterfly that keeps on flying and fluttering over their heads. Although the romp (this is the term for a group of otters; alternative terms include bevy and lodge) seem to be having harmless fun with the butterfly, they in fact have a more sinister intention in trying to get hold of the clueless butterfly. That is they want to eat it. The same way a cat would dine on a butterfly after catching and playing it. 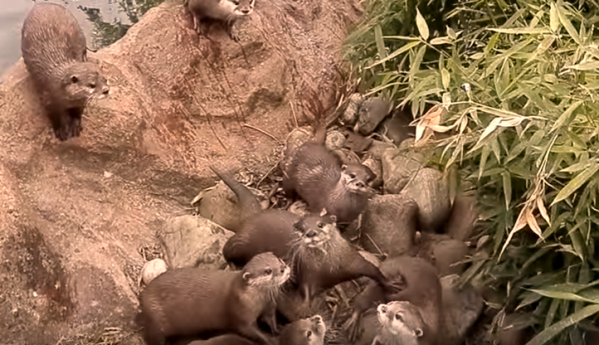 The ones featured in the video look like river otters. These otter primarily dine on fish but they are also known to eat all kinds of other living things like turtles, frogs, rodents, crayfish, crabs, shellfish, oysters, birds, mollusks, crustaceans, and, get this, insects. Butterflies are insects. You can find more information about the otter diet here. You will be surprised to learn that otters are also predators because they prey on rodents, rabbits, and fairly large birds. 1) Otters have very close family relationships. They are among the very few mammals wherein a newborn baby is taken care of by the whole family including the mother, father, and other offspring. 2) Otters are experts when it comes to opening the the shells of shellfish. This is not at all surprising given the fact that shellfish is a favorite food among several species of otters. 3) Otters are known for their playfulness. It's been observed that the animals like to engage in some activities just for the enjoyment of it. 4) Otters are very popular in Japanese folklore stories and legends. They are often referred to in these stories as "kawauso". In these interesting stories, the otters are often portrayed as smart animals that keep on fooling and outsmarting humans. 5) River otters have the ability to stay submerged underwater for up to four minutes. This allows them to swim after fast-swimming fish and other small aquatic animals. 6) More and more people are keeping otters as pets. However, otters are not for everybody because they offer certain challenges which makes it difficult to take care and manage them. For instance, they sometimes bite. Don't forget that otters have rather sharp claws and teeth. And of course, you have to make sure that you have a refrigerator stacked with fish. Otters are voracious eaters.